Those of us with Michigan roots are fortunate to have the State of Michigan Archive and Michigan Historical Center’s online site at SeekingMichigan.org. There are many free record sets to explore, some with immediate downloads – and a few available at low cost. Let’s examine this site to view the most popular and lesser known databases. Michigan began collecting death information in a basic form in 1867. Not everyone complied so many early records aren’t missing, rather they were never filed. Compliance fell in line as the years passed. Early records (1867-1897) were written in log books containing name of deceased, date of death, cause of death, place of death, and parents. Not every record contains all information. Then in 1897 the State of Michigan began collecting information on a standard long-form document. These records contain much additional information: occupation, age, parent places of birth, spouse, informant, age at death, physician information, place of burial, etc. 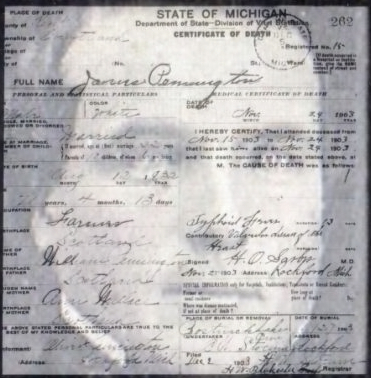 It is these long-form standard certificates that SeekingMichigan.org has scanned in and made freely available online and for download. There are three record sets. Death Records, 1897-1920. Click here. Full scanned documentation. Downloadable. Death Records, 1921-1947. Click here. Full scanned documentation. Downloadable. Death Records, 1948-1952. Click here. Index Only. State Census Records – Early. Michigan began taking census of its population even before it became a State. The majority of these territorial and early State censuses have been lost to time (either donated to paper drive or burned in a fire), so few exist. Some fragments are available online. Search this record set armed with the knowledge that if you don’t find your ancestor living in an area at a specific date you know them to have lived there, this doesn’t mean they weren’t there. Just that your ancestor’s record has been lost. State Census, 1827-1874. Click here. Fragments. Not all counties survived. Downloadable. State Census Records – 1884 and 1894. I wrote an early article entitled “Michigan’s 1894 Census Substitute” which might better be named “1890 Substitute” because it is the 1890 Federal Census that was destroyed by water during a fire. Both the 1884 and 1894 State Censuses contain a plethora of useful information to the family historian for ancestor’s living during this time. Some places are missing. Again, keep this in mind when searching this record set. For instance, I have ancestors who living in Courtland Township, Kent County during 1894. Kent County is listed in this set, but not Courtland Township. The neighboring township due south Courtland, Cannon Township is listed. State Census, 1884-1894. Click here. Some townships missing. Downloadable. Civil War Records, Photographs, Flags and More. Original letters, records and photographs all pertaining to Michigan soldiers digitized by the Michigan Archives. Will you find your soldier? Michigan & the Civil War. Click here. How did your ancestor’s town appear at the turn of the 20th century…or even earlier? In this record set you’ll find photos of many town main streets, lakes, buildings, and other interesting sites. Worth checking into. Main Streets. Click here. Downloadable. Did you know that the Federal government paid land surveyors $3.00 to $4.25 an acre to survey Michigan townships during the heart of winter? These surveys were conducted between 1815 and 1860 and typically took about 20 days to complete using 2 surveyors, 2 axe men, and 2 chain men. These hand-drawn maps are available online for your viewing pleasure and download. To search through this set you will need to know both township and range number. Surveyor Plat Maps. Click here. Downloadable. Do you have a black sheep in your family tree? One who commit a horrible crime and did time for it? If your prisoner did time at the State Prison of Southern Michigan (Jackson), the Michigan Reformatory (Ionia), or the Marquette Branch State Prison, and was sentenced between the late 1800s up to 1985, then you can order their prison card for just $5.00 or their registry record for $20.00. The prison inmate cards give name, sentence length, registration number, county wherein they commit their crime(s), escape attempts, parole information, and discharge dates. The registry records give name, alias, registration number, date of sentence, physical description, date received, age, former occupation, marital status, nationality, citizenship, nature of crime, and could also include criminal history of the inmate. The Archives of Michigan holds naturalization records (both declarations of intent as well as petitions) for many Michigan counties. The year to remember is 1906. If your ancestor filed prior to 1906 he may have only filed a declaration of intent and anything prior to 1906 has limited information not really useful to the genealogist. If your ancestor filed after 1906 you should consider placing an order. First, check the online index for your ancestor’s name. Online index. Naturalization Record. $20. Order here. This record set is in process of being digitized. Once complete they will be freely available exclusively at SeekingMichigan.org. If you would like to help in this process… click here. If your ancestor entered probate in any of the below counties you can order their probate record online. Cost is $10 for an index only search; $20 for a case file only search; and $30 for both index and case file search. Included counties: Alpena, Alger, Calhoun, Cheyboygan, Crawford, Eaton, Genesee, Ingham, Ionia, Jackson, Livingston, Macomb, Mecosta, Midland, Monroe, St. Clair, Van Buren, Washtenaw, or Wayne. These are a sampling of online records available at SeekingMichigan.org. There is so much here to peruse. I can’t recommend the site more highly than I do for any people with Michigan roots.